Whether or not you would ever dress up your own pet, it’s hard to deny that critters look cute in Halloween costumes, no matter what species they happen to be. Here are some of the best animal Halloween costumes from around the web for your holiday ogling pleasure. 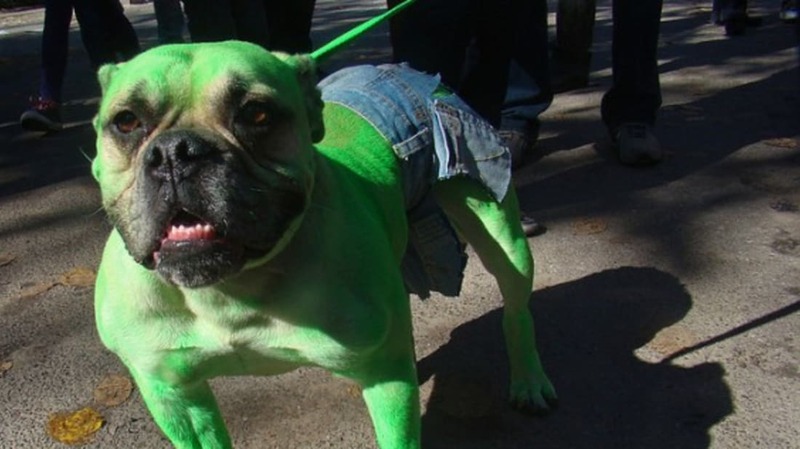 Who would have guessed that bulldogs look so good in jean shorts, even when covered in green paint? Flickr user istolethetv spotted this pup during the 19th Annual Tompkins Square Halloween Dog Parade. “Can you hear the lambs Clarice?” Of course you can’t, they’ve been silenced silly. This might just be the only muzzled dog spotted at the Tompkins Square Parade. Fortunately, istolethetv was still brave enough to approach this man-killer. It’s practically impossible to look Gracie in her delightful hoop skirt and not think to yourself, “Frankly my doggie, I don’t give a damn!” With such a delightfully intricate costume, it’s no wonder she won Best in Show at the 20th Annual Dog Run Halloween contest at Tompkins Square Park in New York City. The design was actually based around the fact that Gracie’s older age makes it difficult for her to stand and walk for long periods of time. That’s why her owner designed a costume that allowed her to sit in place all day on top of a mobile scooter, accentuated by a cat litter dome turned into a hoop skirt. A special thanks to AnimalTourism.com for the great image and back story. You’d be forgiven if you’ve forgotten about (or never even heard of) the 1974 Sean Connery movie Zardoz. But even if you aren’t aware of the origins of this Boston terrier’s ensemble, it’s still easy to appreciate Flickr user daveshumka’s dog Zed’s interpretation of the original. It might not be quite the right holiday for a pilgrim costume, but Thanksgiving is just around the corner and Martha Stewart user newfy certainly has a hard decision to make about that loveable but delicious turkey that keeps following her around. It was hard for Shelby’s owner, Flickr user gopugyourself01, to notice that her pup was turning into a werewolf. After all, her body was already covered in hair her whole life. Really, it wasn’t until the jacket suddenly appeared out of thin air that it became obvious that Shelby was a Teen Wolf. If you always knew your dog was a monster deep down inside, then you’d better contact Etsy seller FairlyEnchanted and order this delightful Where the Wild Things Are costume. Echo here was the very lucky winner of ClickerTraining.com’s pet Halloween costume contest last year. What did she get for sacrificing her dignity by posing as a plant disguised as a dog? A box of yummy treats, of course. Perhaps the best thing about this Star Wars AT-AT costume is that Bone, the greyhound inside, looks utterly unintimidating despite wearing some of the galaxy’s best armor. Costume, image and pet courtesy of Katie Mello. If you'd like your pup to come out looking like the famous former Governor of Alaska, be sure to check out Wiggles Dog Wigs by Ruth Regina. Of course, dogs aren’t the only ones who get to wear costumes during Halloween. Here are a few other critters in adorably cute clothing. Gothamist photographer Katie Sokoler attended the 2010 Cat Fashion Show at the Algonquin Hotel and her images of the geisha, Edward Cullen, Raggedy Anne and Carmen Miranda were simply delightful. If you’ve seen South Park episodes Pandemic and Pandemic 2: The Startling, then you know just how terrifyingly cute guinea pigs in costumes can be. If you have your own guinea pig and want to reenact these episodes, you can buy your own cavie costumes at CuddlyCavies.com, the same shop that supplied South Park with their “monsters.” The shop also provides bunny and dog costumes, so don’t feel left out if you don’t happen to have a guinea pig of your own. There are plenty of costumes out there for smaller animals, and even for bigger-sized dogs, but horses generally get left out when it comes time to get dressed up. Fortunately, TheHorseTailor.com offers all varieties of costumes for your favorite equine friends. A few notable horse costumes available at the site include Batman, the Cowardly Lion, and Harry Potter. Sugar Bush Squirrel is undoubtedly the world’s most famous squirrel model, so it’s really no wonder that he has so many delightful costumes. While his homepage is loaded with delightful images of the star in costume, some of the best pictures feature him dressed as Alex Trebek, Michael Jackson and Snow White. Caiman owner YouTube user MorRokko loves her pet, Hadies, enough to let him celebrate in style with this awesome Iron Man suit. It’s not often you see a caiman dressed up in costume, but let’s face it, it’s not often you see a tiny relative of the crocodile being kept as a pet either. Hadies makes a pretty cute superhero. This might not be the most elaborate costume on the list, but it’s not particularly easy to get a turtle into a costume and this guy does look great as a monster of the deep.